Plenty of leading OEMs worldwide use Performance Motion Devices (PMD Corp.) motor control boards in production, but sometimes size, space, and cost constraints often make designing your own board the best option. PMD Corp. 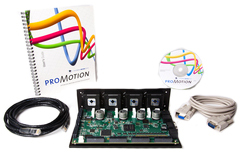 Developer Kits are easy-to-use board and software packages that significantly reduce motion system design time. Our Developer Kit board, software and accompanying manuals provide layout and schematic examples on which to quickly model your own custom board. 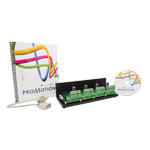 Our intuitive Pro-Motion® development software makes motor setup, profile entry, and system tuning simple and straightforward. Developer’s Kits enable concurrent software and hardware development. While your hardware team develops its custom board, your software team can develop its system on the Developer Kit board. Transferring the finished software solution to a PMD Corp. motion control IC on your own custom board is made fast and seamless using out Common Motion Architecture—maintaining the same communication interface as was used on the development kit board. Need a hand choosing the right Developer Kit for your robotics and automation project? Need help developing the right functionality that your application demands? Contact us any time to talk with one of our software, hardware, or electrical engineers. Chances are good that we’ve already developed the very functionality you’re looking for in one of our custom integrated circuits. "Without PMD Corp.'s complete motion code, experience, and support, it would have taken us at least two years to develop a similar solution." 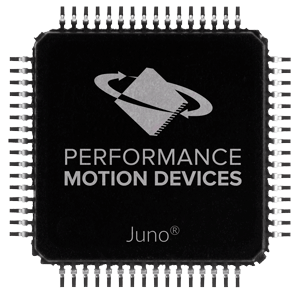 Each Juno® IC Developer Kits is an integrated motor control board and software package used to develop motion application software and exercise a system’s hardware components. The Juno IC Developer Kits provide motor control for DC Brush, Brushless DC, and Step motors (see table below). 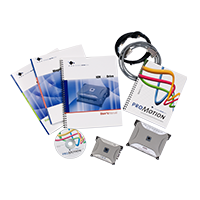 Each kit comes with Pro-Motion® – an interactive Windows based exerciser and data capture software application, and C-Motion® language source code – a library of easy to understand commands. Intel (or compatible) Windows PC , 1 Gbyte of available disk space, 256 MB of available RAM, and a USB drive. The supported PC operating systems are Windows XP, Vista, Windows 7, Windows 8, Windows 10. One step, DC brush, or brushless DC motor. The Juno Developer Kits only a single voltage power supply. The card logic and other circuitry is powered from this input voltage using an on-card DC to DC converter. To get started prototyping your next design, visit our online store to buy a Juno Developer Kit. 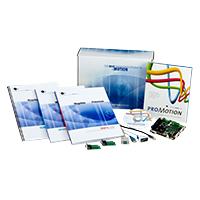 The MC58113 Developer Kit is an integrated board and software package used to develop motion application software and exercise a system’s hardware components. It provides single-axis motion control for a Brushless DC, step, or DC Brush motor. It can also be used as a general purpose motion development system. An on-board amplifier will run your motor up to 250 Watt. The MC58113 IC also includes a digital current loop for current control and ultra-quiet stepper operation. Computer with Pentium or better, one available PCI slot, 200MB of available disk space, 256MB of available RAM, and a CDROM drive. The PC operating system required is Windows 7. 3-phase Brushless DC Motor up to 250W, with optional Hall sensors and optional quadrature encoder feedback with index. Cables as required to connect the MC58113 Developer’s Kit board to your motor, encoder, motion peripheral signals, and board power input. DC power supply (recommend 24 Volt and 10 Amp, but DK will support 12V to 60V). 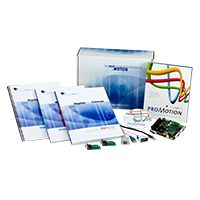 The Magellan® Developer Kit is an integrated board and software package used to develop motion application software and exercise a system’s hardware components. It provides multi-axis (up to 4) motion control for Brushless DC, step, and DC Brush motors. It can also be used as a general purpose motion development system. Only external amplifiers (or the ATLAS Developer Kit) are required to run your motors. The kit comes with your choice of Magellan Motion IC (excluding the MC58113 family). It includes our powerful Pro-Motion Development Software – an interactive Windows based exerciser and data capture program – and C-Motion, which simplifies the software development of motion applications. Cables as required to connect the Magellan IC Developer’s Kit board to your motor, encoder, motion peripheral signals, and board power input. The Atlas® Amplifier Developer Kit simplifies development, allowing designers to quickly and easily build precise motion control systems. Designed to be extremely flexible, the kit allows users to select their preferred configuration of 1 or 4 axes. In addition to product documentation and software distribution media, the kit includes the Atlas Amplifier, carrier board, and L-bracket base with optional heat sink attachment. Brushless DC, step motor, or DC Brush motor type (the motor type should match the specified Atlas Amplifier motor type). DC power supply (recommend 24 Volt and 10 Amp, but DK will support 12V to 56V). For full encoder feedback and position control, consider using a companion positioning IC Developer's Kit such as the DK58113 for prototyping single-axis systems or the DK58420 for prototyping 2, 3, or 4-axis systems. The Prodigy/CME Machine Controller Developer Kit serves as an electrical and software design tool for building control systems with PMD's Prodigy/CME Machine Controller boards. These are versatile and high-performance 1- to 4-axis motion controllers that include on-card Atlas amplifiers; downloadable C-language program support; serial, CAN, and Ethernet communications; and numerous other features. Pentium or better, one available PCI slot, 200 MB of available disk space, 256 MB of available RAM, and a CD-ROM drive. The PC operating system required is Windows 7. Up to four Brushless DC, step motor, or DC Brush motors. Encoder feedback is required for DC Brush and Brushless DC motors. For step motors, encoder feedback is optional. DC power supply per motor (recommend 24 Volt and 10 Amp, but the kit will support 12V to 56V). The machine controller board itself is powered from the Atlas power input for axis #1 using on-board DC-to-DC circuitry. For first-time installation you will connect to both the board's serial port and Ethernet port. Cables as required to connect to the motors you have selected. Each motor axis that is driven by an Atlas amplifier requires a motor drive cable. In addition, feedback signals such as encoder feedback and limits are provided via a separate connector, one connector per axis. The ION® Digital Drive Developer Kit is an easy-to-use digital drive and software package that makes setting up and testing motion systems quick and accurate. The kit consists of an ION 500 or ION 3000, communication and I/O cables, easy-to-use development software, and documentation. There is also an optional heat sink and DIN rail adapter for the ION 500 model. Pentium or better, one available PCI slot, 200MB of available disk space, 256MB of available RAM, and a CDROM drive. The PC operating system required is Windows 7. For RS485 or CAN communications, a PCI board, PCMCIA board, or USB adapter (supporting that communications standard) connected to the PC. Mounting hardware to attach the ION module to your cabinet or system. Limit switches and other motion peripherals as required for the application. Brushless DC, step motor, or DC Brush Motor (should match the selected ION Motor type). DC Power supply (recommend 56 Volt and 10 Amp, but DK will support 12V to 56V). Cables. Either the Stub cable set that comes with ION Developer’s Kits or custom cables designed for your system.